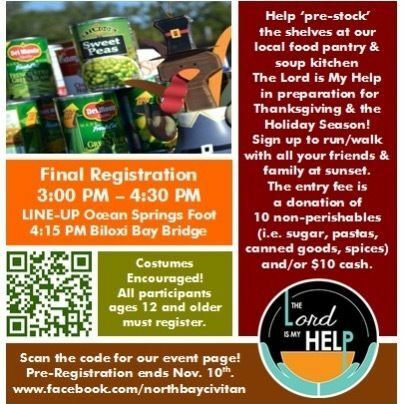 Hosted by: North Bay Civitan Club of D'Iberville-St. Martin, Inc.
Our annual food drive ends with our bridge run at the Ocean Springs foot of the Biloxi Bay Bridge! Help us stock the shelves of The Lord is My Help, our local food pantry/soup kitchen in historic downtown Ocean Springs! Participants wanting to run, walk or roll ages 12+ must pre-register by 5 PM CST before Nov. 10, 2015 if a t-shirt is desired and orders to be processed. If no t-shirt is desired, you may register on raceday from 3-4:30 PM. Minimum donation each of $10 or 10 non-perishable food items such as canned veggies and fruits; salts and seasonings; sugar and spices; pastas, oats, and even cooking oils! Harvest and Thanksgiving-themed costumes are encouraged and may be awarded Most Original and Most Hilarious! See official registration form for official rules and regulations. Request a form at northbaycivitan@gmail.com. Requests for volunteers should be sent to northbaycivitan@gmail.com before our November 5 club meeting. Handing out water bottles to runners and walkers slightly before and after the Gobble Wobble. Takedown upon notification. Giving each runner/walker his or her participant's ribbon to say thank you for helping with this community service! Log in to see who is volunteering for 6th Annual Gobble Wobble Food Drive & Bridge Run!